Non-contact infrared temperature measurements, specifically optimised for roadstone and glass industry applications. An infrared thermometer designed specifically for measuring aluminium extrusion dies. Compatible with System 4 mountings and accessories for accurate alignment. An accurate infrared thermometer optimised for vapour deposition measurements in optical fibre production. 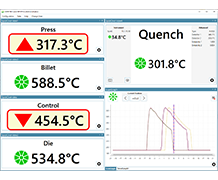 A PC-based software utility enabling connection, configuration and data viewing for up to 40 SPOT infrared pyrometers. Adapted for temperature measurements ranging from 0-2600 °C / 32-4700 °F, SPOT’s extensive model range also meets the individual process challenges for industries including Power Generation, Aluminium, Steel and Industrial Processing. 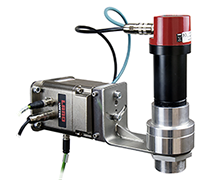 Everything you need is built into SPOT Pyrometers: with no separate processor required, set-up and operation is simple. Intuitive local and remote interfaces manages operational and sophisticated processing functions, while digital and analogue communications and alarm contacts are all included as standard. Patented Bright Green, easy to see pulsed LED sighting pattern ensures optimum focus while exactly confirming the target spot's location and size. Optics feature a motorised focus that can be easily accessed locally at the pyrometer or remotely over an Ethernet link. By integrating motorized focus and sophisticated target alignment technologies to help you precisely focus SPOT’s advanced infrared optics, our ‘point and play’ design gives you an accurate, stable measurement, more quickly – reducing maintenance time and enabling faster process adjustments. Every customer application is different, so the SPOT product range is designed to match specific process challenges. Through extensive hardware, software, accessory and remote sensing options, SPOT partners your needs precisely. 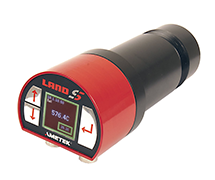 AMETEK Land SPOT Pyrometers are available in a range of models. DID YOU KNOW? SPECIAL APPLICATION AVAILABLE…. We feel the best way to understand the breakthrough that the new SPOT thermometer has made is by trying the online SPOT Simulator. 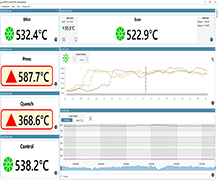 Most of the functionality of the real device is represented: you can set alarms to trigger if the temperature falls outside a defined measurement range, set up outputs, plus many other functions. 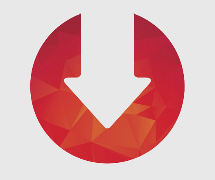 Context-sensitive help will explain the features of the device as you click through it. 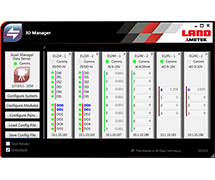 An easy-to-use software utility enabling users to integrate input/output (I/O) hardware modules with AMETEK Land image processing packages. Easy to use utility for configuring various I/O channels and mapping them to Land Thermal imaging and SPOT Pyrometer devices. 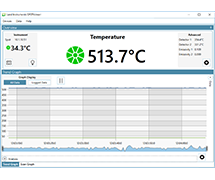 A free PC utility for SPOT infrared pyrometers, allowing configuration, display and logging of data.